This T-shirt, featuring an upside down American flag, has sparked a Memorial Day debate on PacSun's Facebook page. 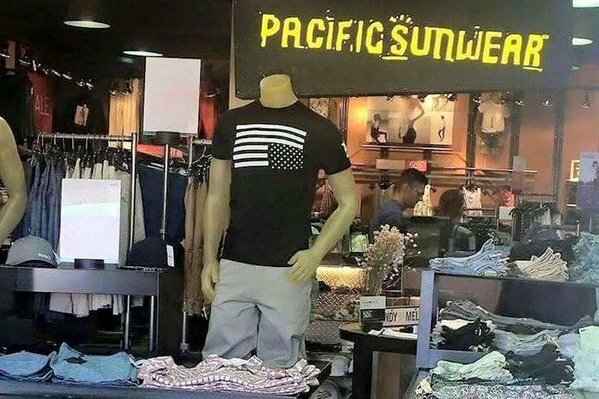 Pacific Sunwear, a California-based clothing retailer, is taking heat for a Memorial Day display featuring a controversial T-shirt. The T-shirt, which depicts an American flag flying upside down, has sparked considerable debate on the company's Facebook page. Some have criticized the shirt as being disrespectful and pledged to boycott the store. Others have defended the shirt, citing freedom of speech. An upside down American flag is recognized as a signal of distress. The debate began when Rachel Zawacki-Kuss uploaded a photo of the T-shirt on display at an outlet in Foley, Alabama, according to Inquisitr.com.